Cut Snake Gourd and remove the seeds. Clean with water. Crush onions, garlic and dry prawn. Mix the crushed thing together with tumeric powder, chili powder, salt and a little fish gravy. Put those thing inside the snake gourd and place the snake gourd in a pot. Cook with 3 spoons of oil and a little water. When the water already gone and the oil comes up the surface, ready to serve. Butterfly Ginger lily blooms in my garden now. A white butterfly gingers has a beautiful fragrance. This one smells of Gardenias and is used in the perfume industry. This plant prefers partial shade, but itcan take full sun with ample moisture. Candy Stripe blooms in my garden. I was sick of paperworks. After walking for 30 minutes, I watched the game. The kids ( I am not sure they are kids anymore or not, they are now Second Year students) really enjoyed the game. Flying discs (commonly called Frisbees) are disc-shaped objects, which are generally plastic and roughly 20 to 25 centimeters (8–10 inches) in daimeter, with a lip. The shape of the disc, an airfoil in cross-section, allows it to fly by generating lift as it moves through the air while rotating. The name Frisbee is a registered trademark of the WhamO toy company, but is often used generically to describe all flying discs. 1. Identify the goal of throwing around the disc. The goal of the game is to get the disc from one end of the field to the other and into the "end zone". Each team wants to get the disc into its respective goal end. The disc must be thrown, and the person with the disc cannot move. 2.Divide into teams. There are two teams of 7 players on a rectangular field. 3. Set up the team layout. Each team starts in the other team's end zone or goal. 5. Continue play. Team A then throws the disc from player to player, down the field towards the goal. 6. Block. Team B will try to force a turnover. This can be done by Team B catching the disc or knocking it to the ground. In any case, if Team A does not catch the disc, Team B gains possession. As this is a non-contact sport, Team B's player must block the disc and not the player. Guard the thrower. Only one player from the opposite team can guard the thrower. 7.Seek further goals. If Team B succeeds in defending, then the disc is now in Team B's possession and Team B will start throwing the disc towards the goal. 8.Continue the game. Play until someone scores. Myanmar Name: Pha Yong Pann. This orchid blooms once each year. It blooms in March, April , summer time in Myanmar. Today, it blooms in my garden which is not in Myanmar, but in Malaysia. Today "February 13 " is General Aung San's Birthday. Here's some poems dedicated to General Aung San. 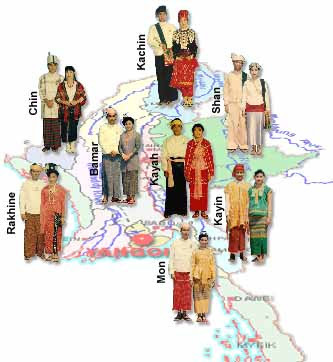 Today 12th February is Union Day of Myanmar. Most of the people are busy for St.Valentine’s Day. Ordering roses, buying chocolates, teddy bear, diamond and all sweet things for loved ones, preparing romantic dinner…and so on. Why do people celebrate Valentine’s party? Why do people spend money buying gifts on St.Valentine’s Day? We , people want to show “love” to our loved ones. So, I am thinking and a question come out from my thinking. Do we love just only on St.Valentine’s Day? We love our loved ones every single day, every single moment, every single minute, every single second…. So..what is needed to keep love going? We need just only emotion that inspires true happiness. Is that the special day just only for couples? It is for every person who can feel love. We love each other in our society. We love our parents, teachers, siblings, friends, classmates, flowers, kids, kittens, puppies and so on. I think, St.Valentine’s Day is not only on 14 February. Every day in a year, all 365 days is St.Valentine’s Day. We love whole year round. Every day is St.Valentine’s Day. I want to give a good person to my society as Valentine gift. lol…no need to buy anything. Me, myself , trying to be a good person is a gift for you. Put the seaweed in a bowl together with water for hours to soften the seaweed. Drain the water. Slice the seaweed into small pieces. Cook the chicken with a little bit of salt, soy sauce (thick) and water. Slice the chicken. Slice the onion, chop chili. Mix the seaweed, chicken, onion, chili, half lemon (juice) and salt to make the salad. Albert Schweitzer’s principle legacy to mankind consists of three words, sealed by a life that was a triumphant example of their power. At sunset one evening, while journeying up the Ogowe River in Africa. Schweitzer ’s mind lighted up with a phrase which brought his whole philosophy of life into sharp focus: Reverence for life. As a jungle doctor Schweitzer found a hospital in Africa which grew from a converted chicken coop into a world-famous institution. Here for half a century Schweitzer practiced his philosophy of reverence for life. “We are like waves that do not move individually but rise and fall in rhythm,” wrote the great man. The phrase Reverence for life is simple and direct. It was Schweitzer’s fervent hope that though be might be forgotten, these words would live. He wanted others to understand them and use them. By striving ti life affirmatively, by looking for the good in life and glorifying it. By having a deep sense of obligation for the precious gift of life. By giving of ourselves that we may repay life, at least in some small measure, for the infinite treasures it pours at our feet. By coming to know that Reverence for life is the very heart of our relations with our fellow men; that we should reverence each other, recognize that we are a part of each other, and live together in a spirit of love. By realizing that when we war on life we war on ourselves, and that Reverence for life is the only pathway to the Kingdom of Peace and Brotherhood. Written by Wilfred Peterson in 1960. In my country "Myanmar", kids eat this waterlily. I never try to eat it. If I eat it, I have to break the petals. When I woke up this morning, I seen the sunshine. yayyy... I love morning sun. There had not been sunshine for 4 or 5 days here. Raining all day long for 5 days. I am really sick of cloudy sky and heavy rain. When I see blue sky, I feel happy. ya..It cannot be storm all the time. After the storm, I believe, there will be sunshine again. And I received some emails wishing me to get well soon. Thank you very much for your kindness, my friends. I can feel all of your kindness in the morning sun.